Dynamometers are a tool, and like any tool they can be used correctly or incorrectly. When the results of an incorrect use are viewed by someone who is not familiar with the dynos operation, the results can be anywhere from misleading to a flat out lie. 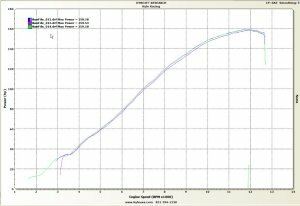 This chart shows a ZX10R with a Sato slip-on, it is the same bike with no changes, EXCEPT the runs are done in different gears. Using 3rd, 4th, and 5th gears, it appears that the runs are different, but actually it is the scale that has made them appear different. Look at the bottom of the graph, it uses MPH instead or the more correct RPM. Since different gears were used the MPH is of course different, this moves the graph line for each run to the right or left. 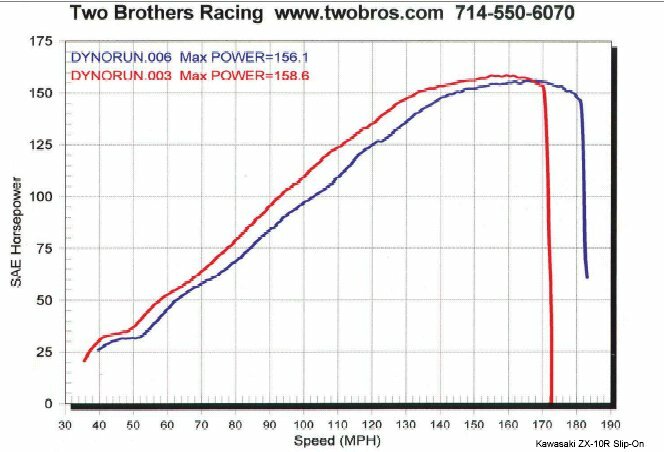 But the curves are the same as is the peak HP. The fact that different gears where used also shows up as each run ends at a different MPH, exactly what one would expect. Below is the same three runs shown with the correct RPM used as the bottom scale. In this case what gear the bike was in does not matter as we are just reading RPM and HP. have used different gears and are pulling a fast one. In this example two different gears were used, showing how much better their exhaust is, when in reality, it appears the stock system may have made more HP. 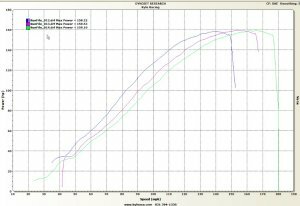 Dynojet has developed a way to interface their top of the line Dyno with their latest Powercommander products. The Dynojet 250 dyno is a Load Control dyno that basically makes the bike react as if it were on the road with a real rider on it by varying the load placed on the motor by using a huge electric brake that controls the force on the rotating dyno drum. By doing this it allows the tuner to determine the best possible Fuel mapping for not just full throttle, but for individual rpm & throttle position combinations (for example 5% throttle @ 4500 rpms) so you can tune for steady state cruise or roll-on acceleration as well as the typical full throttle run. 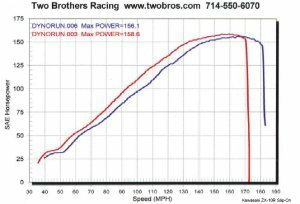 Of course there are so many external variables involved inside the ECU's on todays current sportbikes, most of which revolve around passing EPA emissions testing, that it can be alot to compensate for when trying to get optimal performance out of your fuel injected bike. Just a side note: current technology can build engines that are so efficient they easily pass EPA emissions testing, what they have a hard time passing nowdays is the noise testing & yes the factories do alter the fueling in the ECU to help with the noise testing scenario too. The majority of tuning all comes down to the Air Fuel ratio. Optimum power is generally around 12.6:1 while the stoichiometric value for a gasoline burning engine is about 14.6:1 for a good compromise of performance & mileage while Dynojet themselves generally target 13.2:1 when they build their own maps. 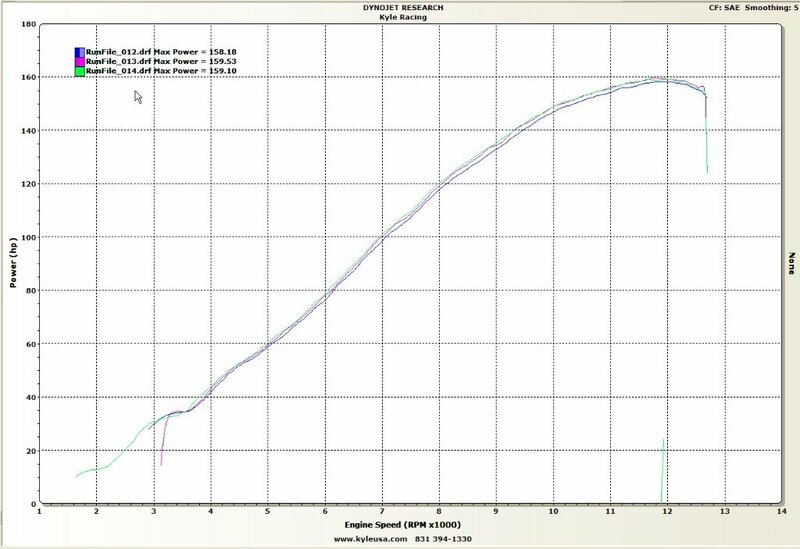 The Dynojet 250 dyno has an O2 sensor as standard equipment & the tuning link software used in conjunction with a Powercommander (PCIIIr) can be set to achieve a user specified Air/Fuel ratio target number & the software will reprogram the Powercommander automatically in a series of sampling stages. These stages are set-up by the user and are basically compromises from one to the next unless of course you set the samples up identically. Now with the factory ECU already over rich it is very hard to find these windows even with a gas analyzer on a load control dyno, but once you add a Powercommander & get a good A/F ratio which produces better power & crisper throttle response then you may start to notice that the bike runs better at certain temps than others. Even with the stock ECU you can tell if you know what to feel for. You yourself may have noticed that at certain temps (harder to tell on bikes without a digital gauge) that the bike seems to run smoother & even shifts easier. Carburated bikes suffer less from this as they don't have external variables from the maps forcing them to change the mixture, but the dyno results can still be skewed by not paying attention to the outside variables during the run. Also if you are paying for carb or mapping work ALWAYS make them show you the Air/fuel ratio charts! All to often I see these guys that pay some shop to make them a "custom" map & for their money they get a dyno chart that has two curves one higher than the other one, but the curves are 100% identical... 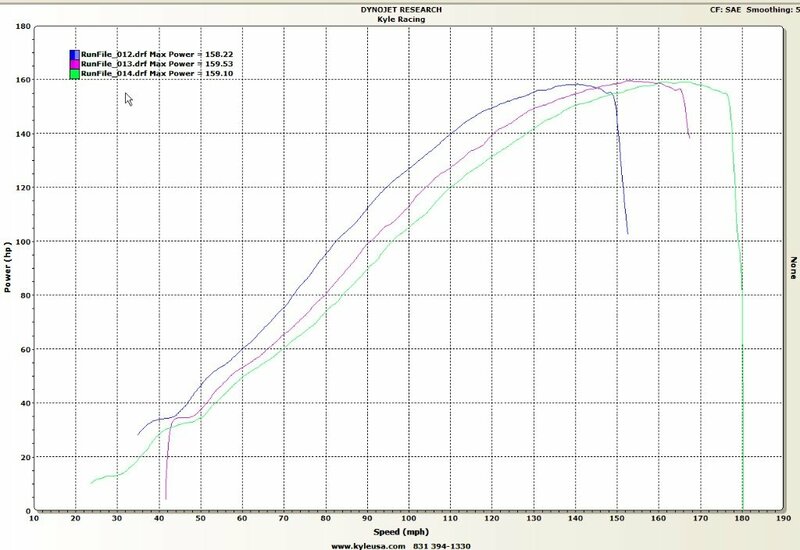 This is usually indicative of fudging the correction factor on the dyno and or switching from DIN to SAE numbers etc... The Air/Fuel chart doesn't lie & if they made mapping changes it will show. The PAIR valve system on all the new Honda's (& many other brands as well) injects fresh air into the headers. If you do not clamp off the tubes (or remove the entire PAIR system as many people do) before doing the dyno runs the exhaust gas analyzer will get false A/F readings of being overly rich.